It’s definitely a rare skill to be able to craft a puzzle game that’s actually easy enough for preteens. Unfortunately, someone at developer Shin’en has that exact gift. 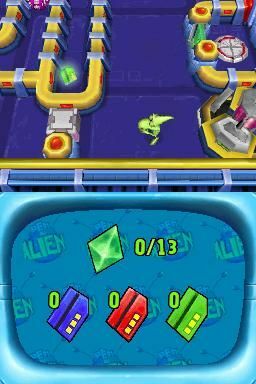 Pet Alien would be a legitimately decent puzzler if it weren’t for the fact that anyone with a double-digit age will smoke through its 80 levels in two, maybe three, hours flat. Attempting to save your human “owner” from space kidnappers, you’re given a cast of five aliens, each of whom has a different ability. The big pink ape can smash ice cubes and cracked walls, the purple dog thing can squeeze through narrow gaps and grab things with its frog-like tongue, the purple bird can fly over mines, the green guy can run up conveyor belts, and the bug-headed blue guy is the only one smart enough to push a crate – remember, we said each had an “ability”, not a “super power”. Description This sorta-fun puzzle game makes up in number of levels for what it lacks in just about everything else. Leave this one to the kiddies.